On first puff, I’m wondering what all the hype is about. Is it a flavorful cigar? Definitely. I’m just having an issue with figuring out what flavors. Is that a touch of leather? Was that a hint of spice? Did I just feel the heat of pepper? Um….Yes, Yes, and Yes. But what about that touch of sweet tea? I, catch that also. The real issue I’m having is that nothing stands out and takes charge. Is this a bad thing? Absolutely not. It makes for a delicious medley that is similar to a ghosted pipe. So, let’s move on to construction while my tastes get to Tango. The wrapper feels like a fine grit sand paper, 2000, 3000, just say, “really fine grit”. The veins are very small, and color is a uniform shade that makes it hard to notice the edges of the wrap. The burn is everything you can ask for. And the draw is enough to make me almost want to throw the pipes away. Ash is substantial and the smoke is thick and white, maybe a bit of blue but just a touch. If there is a real drawback to this stick it is the short length. Not the length of time, but I’m going to be shocked if you don’t want it to be 7 inches longer just to extend the pleasure of smoking it. Strength is a medium, not strong enough to make you sit down, the flavor will take care of that. Not so light that you will contemplate the meaning of life or what you are going to smoke next, just medium. If there is a true issue, it would be that the length screams LUNCH SMOKE, but the slow speed of burn makes it not possible. Sure you could huff on it but, you will not want to. A wonderful smoke, a Binary 1 with no reservations. Be prepared to stuff the nub into a pipe, or burn your fingers. Either way putting it out will feel like a crime. Skip the single stick purchases and get the whole box, you can thank me later. Let me list the bad things quickly before I get into the Review. First, it is a Connecticut, Second it is a H. Upmann. That being said, no I’m not expecting it to be the best cigar I have ever had. History provides some preconceptions, it will be bland and light. But let’s put this aside and give it a fair shot. At First glance, it has a Maduro cap….? Yes, you read that right. There is a reason for that. The cap is more durable this way, a traditional Connecticut leaf is thin and fragile. The cap says (A) where to cut, and (B) makes sure it doesn’t unravel. Also, as seen in the picture above the pristine leaf is truly beautiful with a nice powder feel and a really nice leather scent. Being a Toro, it just feels good in your hand. As per my preference I’m useing a punch. No, this review is not sponsored by Nike, Chick-fil-a, University of Houston, or the Peach Bowl. I didn’t even ask permission but should they want to sponsor, I would be happy to work something out. Back to the stick. Mild black pepper, a light Citrus almost lime, and a slight grass. Nothing stands out as a strong grab at the tastebuds. It is about as I expected. Light and nice but, I note a very pleasant room note. To get the best flavor RETROHALE. The smoke is plentiful and surprisingly thick. I am finding myself drinking more water than normal, a glass of something like a Bourbon would overwhelm the flavors but a mixed drink would not be an issue. Construction is as close to perfect as I have seen in a while and the ash shows some strength. Suggest smoking right up to the band so the heat can loosen up the band from the wrapper. So on to the Binary. 1 but a cautious 1 I’m not really impressed with the stick. You have to remember that it is a Connecticut in every sense of the word. It is a good stick, just don’t expect to much. On first puff I caught something that reminds me of Toast. Not burnt, not merely crisp. That perfect warm fresh from your grandmother’s kitchen kind of toast. A few more puffs and some cherry is now moving into the front. There is also a thin flavor that is there and then gone almost like cashews or macadamia. It is very subtle but it is there with every draw and gone before you blow out. A little farther in, the toast is gone, but hints of Burley, along with the Cavendish for flavor, it is very pleasant. The smoke is thin. Thin enough that you will have to really try to produce an obnoxious cloud. With the room note, I doubt you will want to try that hard. Strength is the only thing I can find that this blend is missing. It is light in strength but tons of flavor. Now to try the Clay. Unsurprisingly, there is no real change from clay to Cob. It is a Peterson blend, it is very unlikely that the blender didn’t put in the work. And guess what I was smoking in Traffic. That’s right The Ugly Briar. And I’m happy to report, there is a faint bit of pepper most likely off of the Burley. Ok, down to the Binary. While it is a little bit light for my preference, it is an all day smoke. I have no problems giving it a 1. For those new to Voodoo Review a 1 means I would buy it. I’m not in the habit of buying stuff I don’t like. Before I go, I read up on this blend. I guess I won’t buy it, it is out of stock everywhere I checked. The Cherry and slightly nutty flavor is Amaretto. So that is Cherry and Almonds. If you find any, let me know, it would be a great change of pace blend. See you tomorrow for Cigars. I would love to tell all of you about what happened this weekend. Unfortunately I’m going to cheat. The following 2 videos are all I’m going to share. This is a unedited walk down vendors row. I’m hopefully clear enough on the sound that there is little to no confusion. This video takes a little bit more time (almost 26 minutes) but to be fair, there was more to show and explain than a fast paced walk would allow. Next year, I hope to see you there. Be aware that cigar reviews are coming 1 per day Monday, Wednesday, and Thursday until I finish the bag. Tuesday will be for pipes. That’s right 4 reviews a week for a while. Long Lives, Big Bowls, and Long Ashes. So, I bought a pipe. Most of us will recognize it. A Savinelli 320 Trevi. Black and Silver just right for a Raiders fan. I want to Review it, but I also want to review Twisted A.E. (name altered to help avoid copyright infringement or confusion.) Mark, if you see this, try Hunting Camp. https://youtu.be/YKd-8QW322c if you want to find Mark, follow the link. I will say that the Latakia in Mark’s blend is Front and Center. There are some other subtle flavors and they polish the finish. I could definitely see smoking this at night after a long day in a Deer Stand or any other autumn evening. Unlike other Latakia forward blends, I find this to have a definite lack of tongue bite. It does have a rich peppery feel and a slight sugary almost apple finish. 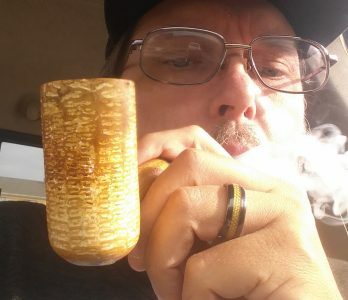 Ok, I will confess, I smoked 2 bowls yesterday one Clay and one Cob, I’m certain that Twisted Autumn Evening smokes best in a big bowl and preferably a Briar. On the Binary I give it a 1. I’m going to have to watch your video to try and figure out the blend or send you money for you to send me more. Very Tasty. Ok, back to the Savinelli. It is quite a heavy pipe, almost uncomfortably heavy in the clench. With the thicker walls, it does not heat up very much so holding it in your hand is very comforting. The ball of the bowl, (and I thought about this for a few hours,) is about the size of a hacky sack. That little bean bag that kids juggle with their feet often seen in beach gatherings. It feels really good in your hand even as it heats up. The stem is slightly bent and for lack of better words fat. A great feeling bit for mouth and lips, the only issue I have found is not smiling while puffing. The system is set up for 6mm Balsa wood Filters but comes with a tube for non filtration purposes. I’m not a filter guy so I guess we all know what I did. The sliver color band is decorated with a Roman aqueduct motif that is very nice. And pairs well with the black rustication. There is even a small Savinelli emblem in the stem that really complements the whole look. In America http://www.briarreport.org has a link to The Pipe Nook and a code for free Shipping. Save the $7 and get a nice pipe stand. The package could have been punted by Ray Guy in his prime and would have still been perfectly fine. I’m already looking forward to next year when I will likely order another pipe from Eddie Gray (The Owner) at The Pipe Nook. OK, I apologize for the April fools joke earlier today, I just couldn’t resist. You know what is not a joke? Bengal Slices and the amount of Latakia pressed into the beautiful bar. It really looks like a Tobacco candy bar. I broke off a very small piece to smoke in the Meerschaum and had to put some back. Density is incredible. The Flavor, is almost pure Latakia. I’m sure it’s not 100%, but the flavor and room note doesn’t leave much room for anything else. If you are a fan of Latakia look no further than Bengal Slices. Rich and slightly peppery with just a touch of tongue bite. Definitely not for the beginner but not completely wrong for a beginner either. Happily it is a relatively slow smoking blend with copious amounts of smoke and full flavored. I’m holding off on strength for now, the Meerschaum is not good for that, but I should know by the end of this review. I’m skipping the clay pipe today, the samples I received from Mark at T.P.I. are just samples. Don’t get me wrong, I am greatly appreciative, but I just don’t have enough to get the Clay and the General so in the interest of a more complete review the clay gets to sit this one out. The Ugly, it took a bit of work to get it lit. Useing the fold and twist method of packing, it just couldn’t get hot enough to hold a decent burn. However, once it finally does reach a good lit condition, it is carefree smoking and very little tamping. The Ugly Briar has always brought out the pepper, and this time is no exception. I am again amazed at the slow speed of burn and impressive amounts of smoke and flavor. The term Latakia Bomb comes to mind. One thing that stands out to me is how little I am drinking while enjoying Bengal Slices. I was certain that I would drink more but 3 sips across 2 bowls is very nice. The ash is a highlight. All gray and very cleanly burnt with no to very little waste so you are definitely getting your money’s worth I couldn’t be more pleased. On to the Cob. Size of the bowl does not matter, materials of the bowl, same thing. I do happen to like the pepper in a Briar more than the Cob or Meerschaum. The smoke is excellent and the feeling of relaxation is superb. A true masterpiece of blending and pressing. Ok, fine, I really do like heavy Latakia blends. As a comparison to blends already reviewed by me, the Sutliff Lord Nelson is similar enough that if you like one you will probably like the other, Bengal Slices has less tongue bite and I detected no faint notes of apple, but they are both highly recommend. The Binary. A 1 without any restrictions or reservations. Only a slight hesitation. You had better like Latakia on top of Latakia for this blend to be enjoyed to its fullest extent. Except for my sample was a thick pressed bar, I couldn’t agree more. It has come to my attention that I have been neglecting too many things that are important to me in my life. With this message I bid you all a fond farewell as I shall be leaving the world of pipes and cigars behind most likely forever. Thank you for the opportunity to be the Review site of choice for the few that took time to read this blog. This post is going out 04/01/2019, and as such, April Fools!